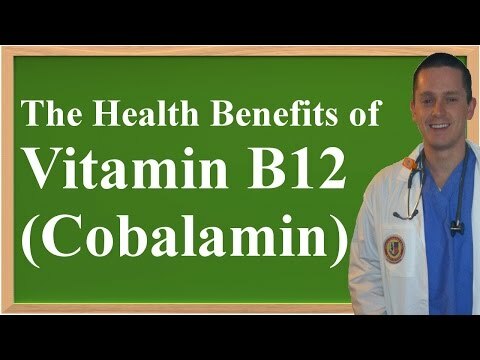 Vitamin B12 or Cyanocobalamin is a very important member of the family of B-vitamins. It is a complex, water-soluble vitamin that also contains cobalt, a metallic ion. Vitamin B12 is absorbed through the gastrointestinal system and interestingly, the liver is able to store adequate supplies of it, making deficiencies rare. However, those who have stomach problems that make absorption troublesome can end up with a deficiency even though they consume the right foods or get adequate supplies via supplementation. Vitamin B12 also works to reduce levels of homocysteine, the amino acids that can damage artery walls and increase a person's risk of developing heart disease. Vitamin B12 is also responsible for ensuring that nerve cells function properly. It's also possible that Vitamin B12 can treat symptoms associated with a loss of calcium including osteoporosis and damage to the teeth. This vitamin may even be able to relieve some symptoms of depression. Animal liver is the best source of Vitamin B12 (Cyanocobalamin). It is important to note that Vitamin B12 is not found in plant tissue. Those who consume a vegetarian-style diet are highly advised to supplement this all-important vitamin. Other good sources of this vitamin include liver, fish, eggs, cheese and meat. Cereals, plant milk, soy products and brewer's yeast that have been fortified with B12 are also good sources, especially for those who consume a vegetarian diet. Symptoms of a Vitamin B12 deficiency develop gradually, usually not becoming apparent for at least a year and often times longer. Anemia is the first sign that the body is not getting an adequate supply of Vitamin B12.